Light Bulbs - silicone dipped, scented, colored, seasonal, flickering, and more styles of light bulbs! We also have torpedo bulbs for wax potpourri warmers. Finish off a country, colonial, or primitive lamp with one of our silicone dipped candle lite bulbs - this is our largest, measuring 5 inches long! Great for larger candlestick or reflector lamps. Candle Lite Bulbs [3 watt - Medium]. 3/4" base. Candle Lite Bulb, by Audrey's. This silicone, candle flame-like bulb features a candelabra base and comes individually packaged. This is for the 3 watt bulb in the large size. Measures about 1 inch in diameter at the widest point of the bulb. Bulb are hand-dipped in silicone, and will vary slightly bulb to bulb. Candle Lite Bulb, by Colonial Tin. 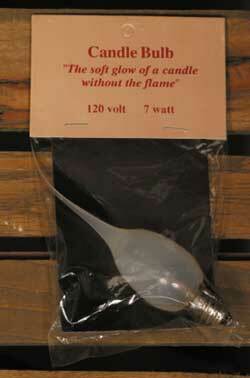 This silicone, candle flame-like bulb features a candelabra base and comes individually packaged. This is for the 3 watt bulb in the large size. 1 inch in diameter. Candle Lite Bulb, by Audrey's. 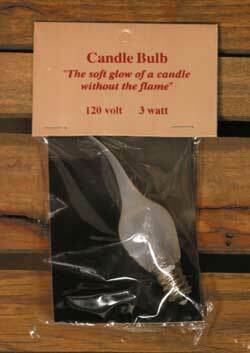 This silicone, candle flame-like bulb features a candelabra base and comes individually packaged. This is for the 7 watt bulb in the large size. Measures about 1 inch in diameter at the widest point of the bulb. Bulb are hand-dipped in silicone, and will vary slightly bulb to bulb. This 4-watt candelabra light bulb has been hand-dipped in translucent colored silicone. This heat-safe coating is loaded with cappuccino-scented flecks that release a light, subtle fragrance as the bulb warms. This 4-watt candelabra light bulb has been hand-dipped in translucent tan colored silicone. This heat-safe coating is loaded with caramel apple-scented flecks. This bulb is hand-dipped in pearlescent golden ivory silicone for the warm glow of candlelight without flames. Fits most standard sockets, and is 7.5 watts. This 4-watt candelabra light bulb has been hand-dipped in translucent cinnamon-colored silicone, giving off a warm glow. Bulb is not scented. This 4-watt candelabra light bulb has been hand-dipped in translucent reddish brown colored silicone. This heat-safe coating is loaded with cinnamon clove-scented flecks. This 4-watt candelabra light bulb has been hand-dipped in translucent ivory colored silicone. This heat-safe coating is loaded with cookies and cream-scented flecks. Cranberry Silicone Light Bulb, by Vickie Jean's Creations. This 4-watt candelabra light bulb has been hand-dipped in translucent deep red colored silicone. This heat-safe coating is loaded with cranberry scented flecks that release a light, subtle fragrance as the bulb warms. Crisp Cotton Scented Silicone Light Bulb, by Vickie Jean's Creations. 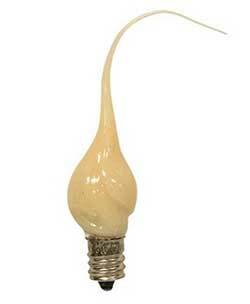 This 4-watt candelabra light bulb has been hand-dipped in translucent ivory colored silicone. 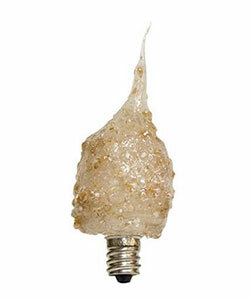 This heat-safe coating is loaded with cotton-scented flecks that release a light, subtle fragrance as the bulb warms. Features a bright white dip that glows in the dark when off, and hand-painted details. Hazelnut Scented Silicone Light Bulb, by Vickie Jean's Creations. This 4-watt candelabra light bulb has been hand-dipped in translucent golden brown colored silicone. This heat-safe coating is loaded with hazelnut-scented flecks. Features a two-color dark green and speckled orange dip with hand-painted details. Lilac Silicone Light Bulb, by Vickie Jean's Creations. This 4-watt candelabra light bulb has been hand-dipped in translucent purple colored silicone. This heat-safe coating is loaded with lilac scented flecks that release a light, subtle fragrance as the bulb warms. This 4-watt candelabra light bulb has been hand-dipped in translucent wine red colored silicone. This heat-safe coating is loaded with fruity mulberry scented flecks that release a light, subtle fragrance as the bulb warms. This 4-watt candelabra light bulb has been hand-dipped in translucent golden colored silicone. This heat-safe coating is loaded with orange clove scented flecks that release a light, subtle fragrance as the bulb warms. Finish off a vintage, steampunk, or industrial style lamp with one of our reproduction Edison light bulbs! 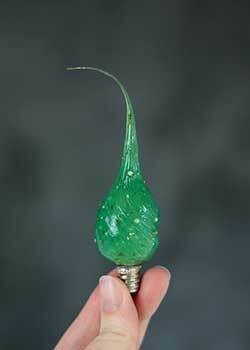 This bulb is a pear style with an interesting, intricately tangled filament. This bulb is hand-dipped in pearlescent white silicone for a soft glow - Light travels throughout the coating to the flexible tip! Pet Paws Silicone Light Bulb, by Vickie Jean's Creations. This 4-watt candelabra light bulb has been hand-dipped in white silicone, and hand painted with a black dog or cat paws. 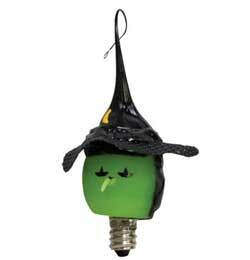 Super cute in a nightlight or electric candlestick! This 3-watt candelabra light bulb has been hand-dipped in cotton candy pink color silicone, and accented with pipe cleaners, beads, and pom poms to create a darling bunny head! Great for Easter, or in a little girl's bedroom. Plum Silicone Light Bulb, by Vickie Jean's Creations. This 4-watt candelabra light bulb has been hand-dipped in translucent purple colored silicone. This heat-safe coating is loaded with fruity plum scented flecks that release a light, subtle fragrance as the bulb warms. Primitive Crow Silicone Light Bulb, by Vickie Jean's Creations. This 4-watt candelabra light bulb has been hand-dipped in warm tan color silicone with little grubby flecks inside, and hand painted with a primitive crow and heart design. Super cute in a nightlight or electric candlestick! 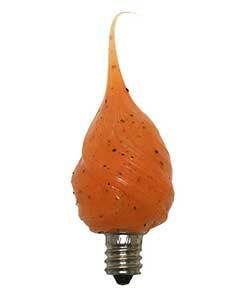 This 4-watt candelabra light bulb has been hand-dipped in translucent deep orange colored silicone. Pumpkin Spice Scented Silicone Light Bulb, by Vickie Jean. This "Tiny Tim" sized 3-watt candelabra light bulb has been hand-dipped in translucent deep orange-colored silicone. This 4-watt candelabra light bulb has been hand-dipped in translucent teal colored silicone. This heat-safe coating is loaded with fresh ocean scented flecks that release a light, subtle fragrance as the bulb warms. Finish off a vintage, steampunk, or industrial style lamp with one of our reproduction Edison light bulbs! This bulb is smaller sized, with an interesting, tangled filament. 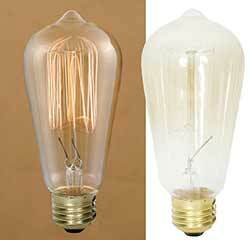 This 3-watt candelabra light bulb has been hand-dipped in translucent wheat-colored silicone. This heat-safe coating is loaded with rose and spice-scented flecks. This 4-watt candelabra light bulb has been hand-dipped in translucent teal colored silicone. This heat-safe coating is loaded with sweet pea scented flecks that release a light, subtle fragrance as the bulb warms. This 3 watt bulb is hand-dipped in cream colored silicone for a soft, candle like glow! This 4 watt candle glow bulb is coated with a cream color silicone and gives off a warm glow. 40 watt Torpedo Bulb, by CTW Home Collection. 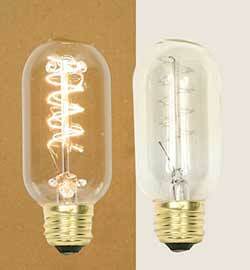 Standard-sized torpedo-style light bulb for chandeliers and stick lamps. This is the 40 watt bulb. Other wattages also available! Note, this bulb does not flicker. 60 watt Torpedo Bulb, by CTW Home Collection. 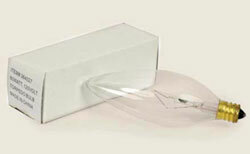 Standard-sized torpedo-style light bulb for chandeliers and stick lamps. This is the 60 watt bulb. Other wattages also available! Note, this bulb does not flicker. 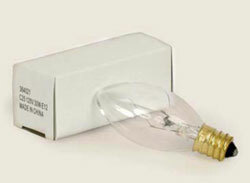 25 watt Short Torpedo Bulb, by CTW Home Collection. Replace burned-out bulbs in electric wax warmers, night lights, and more. This is for the SHORT bulb, which has the same size base as a candelabra bulb, but is shorter, to fit inside night lights and tart burners. This is the 25 watt bulb, suitable for most wax warmers. Dipped in translucent, matte red silicone, and hand painted with white heart and XO decals, and lightly glittered for a subtle sparkle. Finish off a vintage, steampunk, or industrial style lamp with one of our reproduction Edison light bulbs! 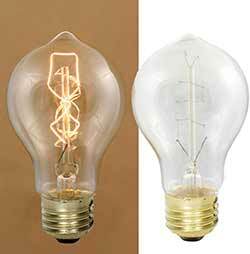 This bulb is the classic antique style shape with an interesting, tangled filament. Features a two-color black and bright green dip with a mesh hat brim, a pointy nose, and hand-painted details.